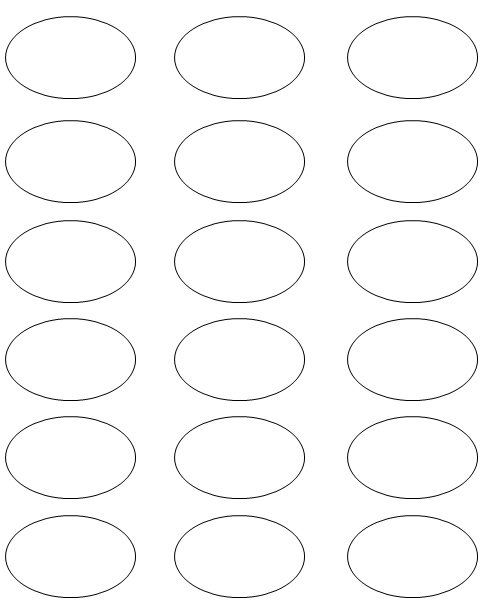 Our oval label template is designed to be easy to use. This template prints out 18 oval labels per page, giving the user a label that stands out a bit from everyone else. Our label prints out with Word or Avery® and works with most printers. Our labels allow you to easily change your labels to fit a new product, season or special event. Each label prints out to 63.5 x 42.3 mm, a size that fits easily on most envelopes and stationary. Despite the oval shape, there is plenty of room for each line of information to fit easily on the template. You have the freedom to select your choice of color and font types and sizes. This allows you to design a distinct label that will stand out from the rest. Once the oval label template is designed by you, it can be stored on the business’ computer for future use. Our label includes separate lines for all the information you will want to include on your labels. Our oval label template gives you the freedom to try out different designs and colors. This provides you with maximum flexibility when designing your labels. Imagine using red, blue or green labels for the holiday season. Reds, orange and yellow are great colors to choose when summer begins. Or, you can simply use your company’s logo colors. Since our templates work with both Microsoft® Word and Avery®, any company should be able to easily print them out on their current equipment. With the labels printing 18 per page, a business can save money by simply printing out labels when they need them. If a business does a periodic mailing, these lists can also be saved by the template. Clearly the oval label template offers a great option for any business with its unique labels.